Dr Frederick Fasehun and Gani Adams, both factional leaders of the Oodua People’s Congress have decided to end their rift. Dr Frederick Fasehun and Gani Adams, both factional leaders of the Oodua People’s Congress (OPC), have decided to end their rift. Both have been enemies since the reign of former Head of State, late Sani Abacha. 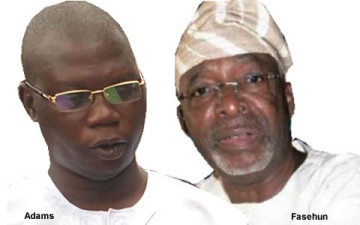 In a communique issued and signed by the trio of OPC chieftains, Razaq Arogundade, Dare Adesope and Mutiu Balogun Ololade after participating in the Yoruba Unity Retreat organised by Yoruba Leadership and Peace Initiative in Ibadan, the congress said OPC is now one with no allegiance to any of the two leaders. The communique urged all Yoruba sons and daughters, Yoruba leaders and the entire citizens of Nigeria, “to henceforth see Oodua Peoples Congress, OPC, as one with no affiliation to any faction. As Oodua Peoples Congress, OPC, is now one; we have resolved to defend Yoruba Nation from any form of attack either internal or external attacks. Any attempt by any tribe, group or people to attack, molest or tamper with the fundamental human rights of Yoruba sons and daughters will be met with equal response from Oodua Peoples Congress, OPC.